I haven’t been this excited about a recipe in a minute. I’ve been sitting on it since early August waiting for the appropriate weather before sharing this. Because who wants to stand over a hot stove in 90 degree Chicago heat? No one. Absolutely no one. If you’re a regular reader of i am rorie, you know I love sweet potatoes. I can’t be wasting time on regular potatoes. Sweet potatoes have so much natural flavor that pairs well with a variety of spices and cuisines and it’s packed with Vitamin A - just one of its many nutritional values. What’s not to love? If you’re a sweet potato lover like myself, I have an endless supply of recipes focused on this nutrient dense spud. Some personal favorites are my Sweet Potato Kielbasa Skillet, perfect for the oncoming colder months with lots of protein. Or if you’re looking for an easy movie night snack, my Sweet Potato Truffle Fries with Garlic Aioli are fry lover’s heaven ready in less than 40 minutes. In this recipe specifically, I wanted to pair the sweetness of these orange spuds with something that has a subtle bite. Ever since I seriously started cooking, I’ve found a new love for onions, of all shapes, sizes, and varieties. I knew I wanted to incorporate an onion that would cut the sweetness of the sweet potatoes just enough without overpowering its flavor all together. Scallions offer the perfect balance I was looking for to create a sweet and savory potato pancake. 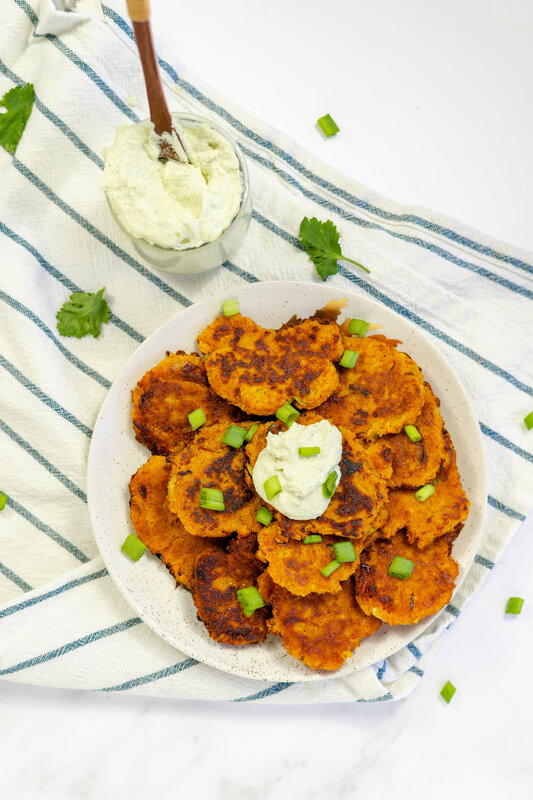 I have a feeling most potato pancakes are meant to be a side dish in a larger meal, but I love making these with a meal prep type of mentality. 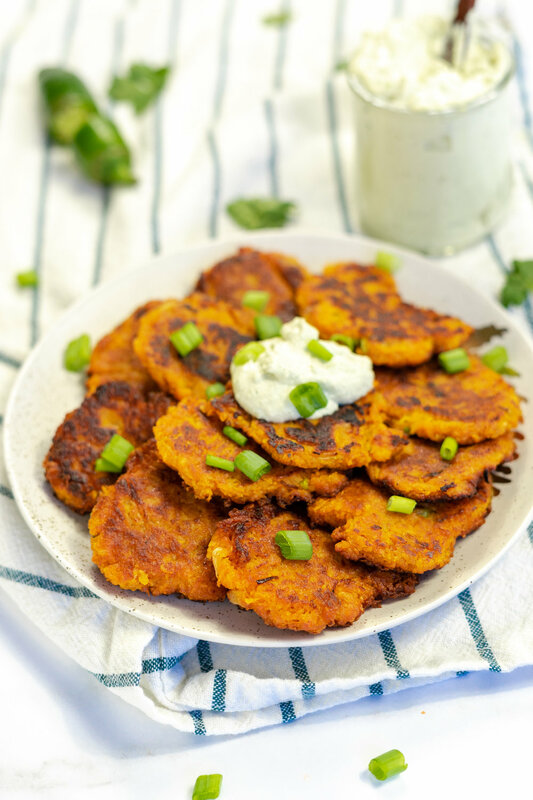 I store them in a sealable container in my fridge, heat them up in a pan for about 2 minutes, and spread my Jalapeño Crema on top for a quick breakfast or snack. It’s so delicious and warming, I eat it like I would toast. You can also freeze them if you want! I do not have a waffle maker, but I have a feeling these would taste amazing as waffles! Top them off with some vegan butter and a healthy pour of maple syrup - yum! Layer a large glass bowl with two sheets of paper towel. Using a grater - not a food processor - grate your peeled sweet potatoes into the large glass bowl until all the sweet potato has been grated. Take another sheet of paper towel and gently press on the grated sweet potato to remove any excess water. Remove the paper towels from the bowl. Add the all purpose flour, baking powder, salt, and scallion to the glass bowl, folding the mixture together with a spatula. Once everything appears to be evenly combined, start forming small pancake shaped patties, about 1/3 inch thick. Place a paper towel on a plate that you will use for cooling and absorbing excess oil once the pancakes have been cooked. In a large sauce pan on medium heat, add 1 tbsp of vegetable oil. Allow to spread on all sides of the pan. Begin to add your sweet potato scallion pancakes to the pan, no more than 4 at a time maximum. Allow to cook on one side for about 2 full minutes before flipping or once they appear to be crisping. Gently flip each pancake and allow to cook another minute or 2 on the uncooked side. Depending on your preference you can allow them to get a slight burn but not too much. When a pancake is done cooking, remove from the pan and place on the paper towel lined plate. Create one layer made of 3-4 pancakes - not stacked directly on each other - and then place another paper towel over that layer, continuing this process until you’ve finished cooking the pancakes. When finished, either store the pancakes in a sealable glass container or serve immediately on a large plate with extra scallions (and the Jalapeño Crema if you’d like! ).